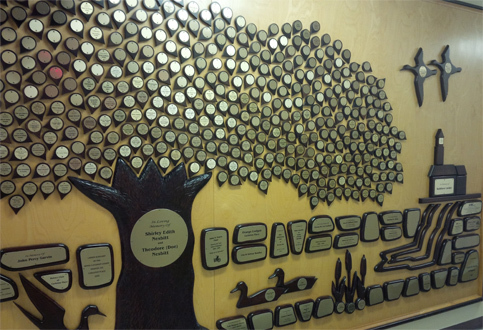 The River of Life donor recognition mural was established by the CPDMH Auxiliary to raise funds for the hospital. Created by a team under the lead of Past-President Melba Jarvis in 2001, and crafted by Artwood Studios of Wilno, Ontario, the River of Life artistically depicts the beauty of our rural home. It includes elements such as the leaves, ducks, geese, bulrushes, and river stones that adorn the Mississippi River as seen below Morphy Falls and the Town Hall. The mural incorporates brass plaques that are ready to be engraved in recognition of individuals or groups. In the last year, the River of Life raised over $22,000 to assist with patient care. 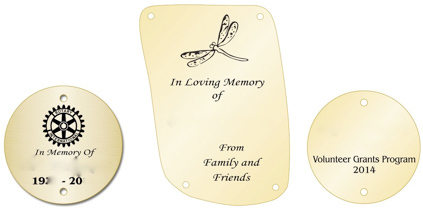 Supporters of CPDMH can contribute to this legacy project through the purchase of a uniquely engravable “Leaf” or “Stone” in price ranges between $500-$5,000. Each provides a visible symbol in memory or recognition of individuals or groups. Font size is the only real limitation for inscription as samples below illustrate. You may choose to make purchases online, and someone will contact you to confirm details of your requested inscription requirements. You may make purchases by downloading a fillable form, or a hand completion form or by contacting the Auxiliary by phone or email.